In today’s world, being a writer is, I believe, much more difficult than it used to be; there are so many opportunities, so many things to do in terms of marketing and promotion, and, quite frankly, a lot of push to be busy, busy, busy to advance—and if I’m not “advancing” by my own standards, it gets depressing. For me, why I write isn’t just because I can’t help myself: there is no way in the world I would ever stop writing, because it’s simply something I’m constantly driven to do; it’s part of me, it is me. So no matter how down I get sometimes, I’ll never swear off doing it. Still, there’s another reason I write, and that’s to reach someone. There are short stories and novels out there I read that changed the course of my life, or how I thought about things; those writers reached me and affected me. I always wanted my work to reach and affect someone in the same way. 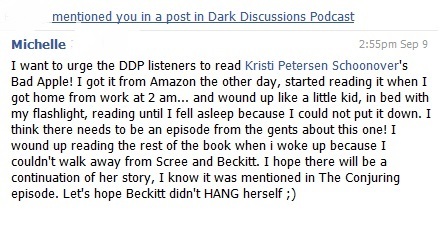 Recently, Nathan and I guested on one of my favorite podcasts, Dark Discussions—“a discussion of horror film, fiction, and all that’s fantastic”—about the film The Conjuring, and my book, Bad Apple, was mentioned. This might sound hard to believe, but reading that, for me, was more fun than getting a royalty deposit. My work made someone feel like she was a kid again. That’s pretty incredible. When I read or hear something like that about my work, I realize advancing—as the world sees it, anyway—doesn’t really matter…if I’ve reached one person, I’ve done my job. Why do you write? If you’ve been feeling a bit untethered or discouraged lately, it might help to stop and think about what your ultimate goal really is, and how you’ve met those goals in the past. It just might get you grounded and back at the keyboard. 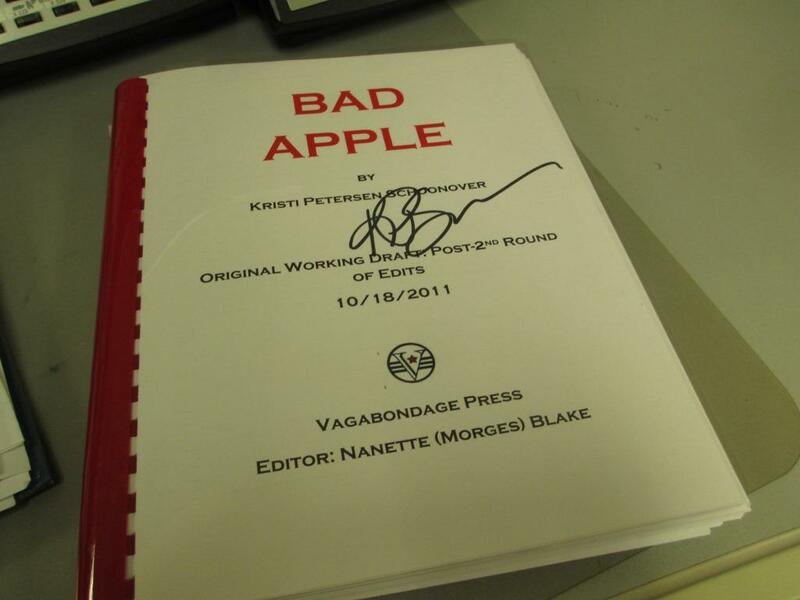 Draft, Post-2nd Round of Edits, 10/18/11, as it looked when it came out of the box in my basement. 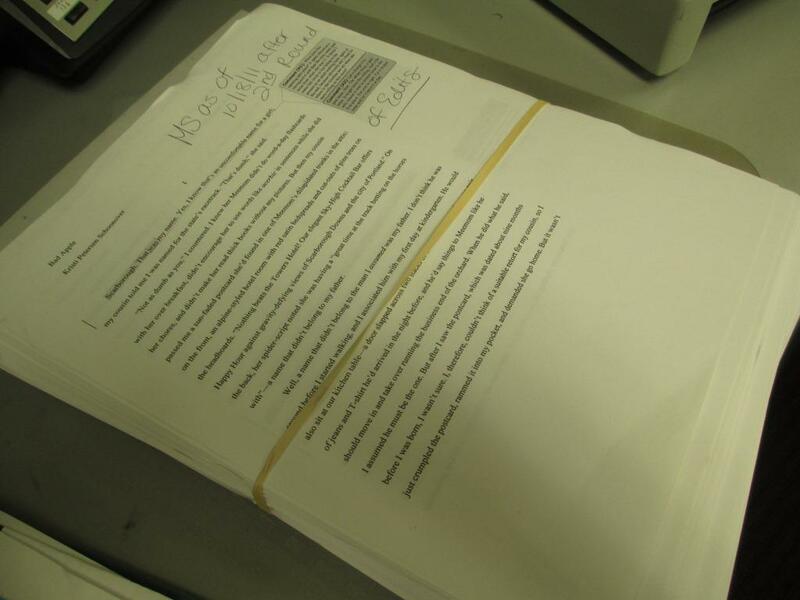 Draft, 2nd Round of Edits, 10/18/11, as it looked after dressing it up. Posted on October 7, 2013, in Bad Apple, Deep Thoughts & Fun Stuff, The Writing Life and tagged bad apple, Dark Discussions Podcast, how to focus on writing goals, how to get out of a writing slump, what to do if you’re depressed about your writing. Bookmark the permalink. 2 Comments. Well, hey, I really do care, I read all your posts, and they inspire me. And as I like to believe, if we have reached even only ONE person, then we, as writers, have done our work. And never let go of that. No matter what. True, it is easier said than done, but after all you’ve been through, you can do it. And yes…money is, really, the root of all evil. However, most people I’ve met who have scads of cash don’t have what we do…an awareness, a sensitivity, an understanding of what’s truly important. While that doesn’t make the rent, I wouldn’t trade what I’ve been through for anything. And they can’t take it with ’em. Just tell ’em how pretty they’ll all look in their coffins nestled among a pile of dollar bills. Don’t give up. You’re doing good work. If for no one else, for me. And remember the golden rule: if people don’t like something, they tell 11 people. But if they LOVE it, they tell only 3 — the 3 who actually care.